After the 46-year-old line ruptured twice in six months, the federal Office of Pipeline Safety yesterday told Williams Northwest Pipeline it must replace every section of line it hopes to use, or prove it is resistant to stress corrosion cracking. Williams Northwest Pipeline supplies 80 percent of Washington's gas, primarily from Canada and the Rocky Mountains, and is a subsidiary of the Tulsa, Okla.-based Williams Cos., which moves gas through 14,000 miles of interstate pipelines. The company's natural-gas artery burst with a roar on May 1 near Lake Tapps, sparking evacuations at a school, a supermarket and about 40 homes. While such eruptions are typically caused by land movement or other outside forces, inspectors later identified the cause as stress corrosion cracking. The line had passed inspection within the previous year. The same type of cracking caused another section of the Williams line to leak in 1999 and fail during tests in 1992. 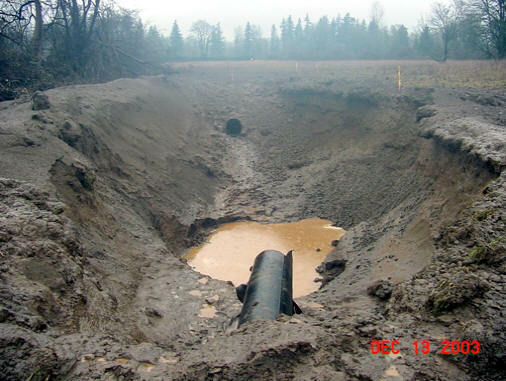 In 1994, a lateral line on the same system near Oregon City, Ore., failed 22 times during tests. After repairs were made to the line near Lake Tapps in May, inspectors ordered the company to reduce the line's gas pressure 20 percent to 632 pounds per square inch. Following a similar break on an oil pipeline in Tucson, Arizona that sprayed 30,000 gallons of diesel fuel onto homes, federal inspectors issued a formal alert to pipeline operators about stress corrosion cracking. Inspectors typically examine lines by running water through them at high pressure. But such hydrostatic testing doesn't guarantee there's no problem there and can't reveal stress corrosion cracks. Until recently, companies weren't required to do the complex in-line inspections that might catch the problem. "We have no actual regulation saying that you need to address (stress corrosion cracking) in your pipelines," said Hill, with the federal safety office. "Basically, it's a new phenomenon, and we're studying it." Even today, state and federal regulators acknowledge stress corrosion cracking must be considered when evaluating a line's integrity, but in-line testing is required only where pipelines run through populated areas. Companies can get around even those tests, some said. "The problem, particularly in the gas industry, is they aren't built for this kind of testing, so the law gives them an out," said Kim West, senior pipeline-safety engineer for the state. For now, Williams is ramping down the gas in its pipeline to 100 pounds per square inch or 12% of its capacity, which essentially takes the line out of service. The company must improve all lines in populated areas within three years and improve the entire system within a decade. All told, Williams expects to have to replace about 100 miles of pipe.